New research shows a cereal familiar today as birdseed was carried across Eurasia by ancient shepherds and herders laying the foundation, in combination with the new crops they encountered, of 'multi-crop' agriculture and the rise of settled societies. Archaeologists say 'forgotten' millet has a role to play in modern crop diversity and today's food security debate. Now a forgotten crop in the West, this hardy grain - familiar in the west today as birdseed - was ideal for ancient shepherds and herders, who carried it right across Eurasia, where it was mixed with crops such as wheat and barley. This gave rise to 'multi-cropping', which in turn sowed the seeds of complex urban societies, say archaeologists. A team from the UK, USA and China has traced the spread of the domesticated grain from North China and Inner Mongolia into Europe through a "hilly corridor" along the foothills of Eurasia. Millet favours uphill locations, doesn't require much water, and has a short growing season: it can be harvested 45 days after planting, compared with 100 days for rice, allowing a very mobile form of cultivation. Nomadic tribes were able to combine growing crops of millet with hunting and foraging as they travelled across the continent between 2500 and 1600 BC. Millet was eventually mixed with other crops in emerging populations to create 'multi-crop' diversity, which extended growing seasons and provided our ancient ancestors with food security. The need to manage different crops in different locations, and the water resources required, depended upon elaborate social contracts and the rise of more settled, stratified communities and eventually complex 'urban' human societies. 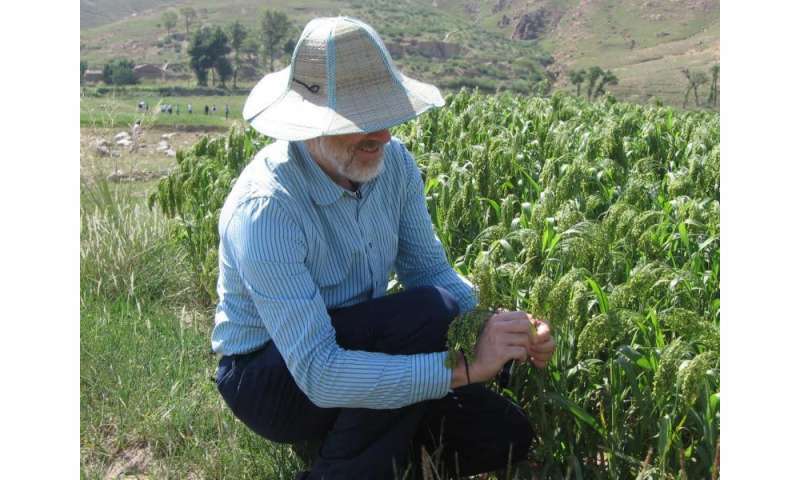 Researchers say we need to learn from the earliest farmers when thinking about feeding today's populations, and millet may have a role to play in protecting against modern crop failure and famine. "Today millet is in decline and attracts relatively little scientific attention, but it was once among the most expansive cereals in geographical terms. We have been able to follow millet moving in deep history, from where it originated in China and spread across Europe and India," said Professor Martin Jones from the University of Cambridge's Department of Archaeology and Anthropology, who is presenting the research findings today at the Shanghai Archaeological Forum. "These findings have transformed our understanding of early agriculture and society. It has previously been assumed that early agriculture was focused in river valleys where there is plentiful access to water. However, millet remains show that the first agriculture was instead centred higher up on the foothills - allowing this first pathway for 'exotic' eastern grains to be carried west." "We can see that millet in northern China was one of the earliest centres of crop domestication, occurring over the same timescale as rice domestication in south China and barley and wheat in west China," explained Jones. "Domestication is hugely significant in the development of early agriculture - humans select plants with seeds that don't fall off naturally and can be harvested, so over several thousand years this creates plants that are dependent on farmers to reproduce," he said. "This also means that the genetic make-up of these crops changes in response to changes in their environment - in the case of millet, we can see that certain genes were 'switched off' as they were taken by farmers far from their place of origin." As the network of farmers, shepherds and herders crystallised across the Eurasian corridor, they shared crops and cultivation techniques with other farmers, and this, Jones explains, is where the crucial idea of 'multi-cropping' emerged. "The first pioneer farmers wanted to farm upstream in order to have more control over their water source and be less dependent on seasonal weather variations or potential neighbours upstream," he said. "But when 'exotic' crops appear in addition to the staple crop of the region, then you start to get different crops growing in different areas and at different times of year. This is a huge advantage in terms of shoring up communities against possible crop failures and extending the growing season to produce more food or even surplus. "However, it also introduces a more pressing need for cooperation, and the beginnings of a stratified society. With some people growing crops upstream and some farming downstream, you need a system of water management, and you can't have water management and seasonal crop rotation without an elaborate social contract." "The focus for looking at food security today is on the high-yield crops, rice, maize and wheat, which fuel 50% of the human food chain. However, these are only three of 50 types of cereal, the majority of which are small-grained cereals or "millets". It may be time to consider whether millets have a role to play in a diverse response to crop failure and famine," said Jones. "We need to understand more about millet and how it may be part of the solution to global food security - we may have a lot still to learn from our Neolithic predecessors."